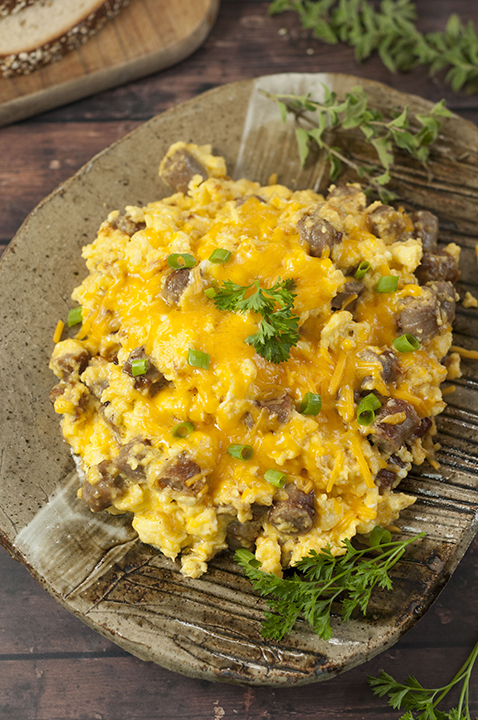 Sausage, Egg, and Cheese Scramble recipe is a tasty combination of your favorite breakfast foods for a hearty weekday morning or Sunday morning family breakfast! I cannot believe we’re already over a week into September and its back-to-school time! I hope everyone is transitioning easily this week as I know it can be hard getting back into a routine. First and foremost, we are thinking all of those threatened by hurricane Irma this week. I can’t even believe all the crazy weather events happening in the news lately! This Sausage, Egg, and Cheese Scramble is one of the easiest meals I’ve made in a while and I can’t wait to tell you about it. First, I have something really cool to share. For the second year in a row, Johnsonville is generously providing us with something called the “Sausage Support Center”. This is a super special hotline that helps families struggling with the back to school grind and coming up with quick and easy meal ideas when we’re all short on time. When you call the line, the friendly person on the other end of the line will be real-live Johnsonville employee located in Sheboygan Falls, Wisconsin. 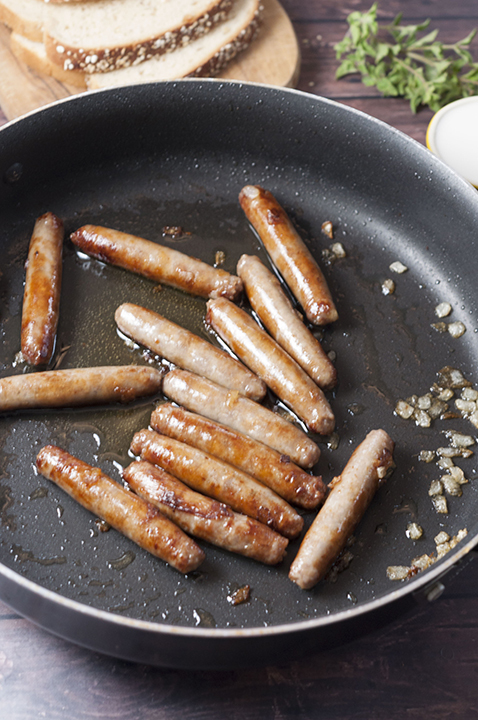 You can rest assured you will be receiving the best advice since they are the actual makers of Johnsonville! The Sausage Support Center will be live during the work week through Friday, Sept. 8, and again from Monday, Sept. 11- Friday, September 15 (with the exception of weekend hours). All you have to do is Dial 844-9 SAUSAGE or text 97406 (to reach the Bob Bot) and you will reach a highly knowledgeable Johnsonville employee who will help you by sharing sausage recipe ideas, time-saving tips and tricks, and clear step-by-step instructions to help you get into the back-to-school swing of things. I highly encourage you to call or text today or tomorrow and check it out for yourself! They understand how hard meal planning can be, especially this time of the year. They asked me what I was craving or in the mood for and I got plenty of recipe ideas that fit my taste. I received great breakfast AND dinner ideas! Fun fact: the “Bob Bot” was created after a real Johnsonville member named Bob who was a 60+ year old Sanitation Coordinator and former player for the Green Bay Packers! 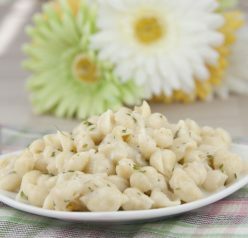 Who doesn’t need an easy breakfast idea to serve to your family before everyone is off to school and work? 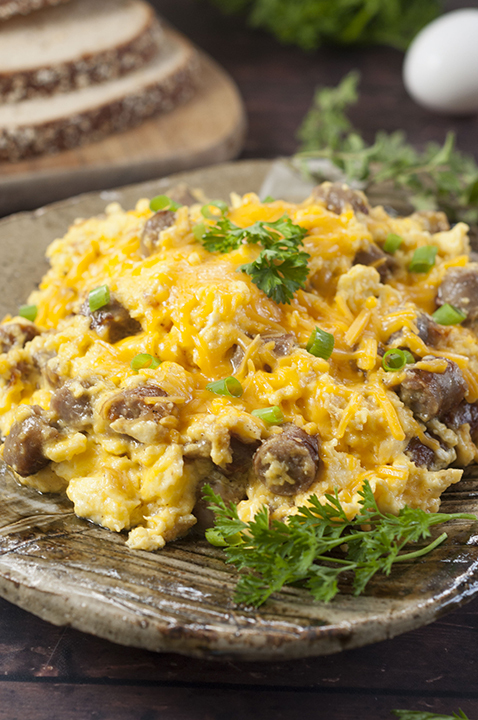 This sausage, egg, and cheese scramble is delicious, filling, and can be prepared in no time at all. Next time you’re craving breakfast, this NEEDS to happen. It reminded me of my Scrambled Egg Breakfast Muffins, but even easier. 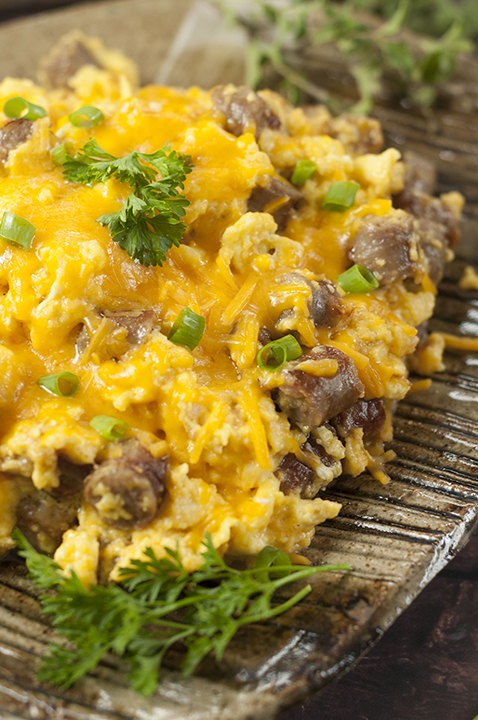 I used my favorite breakfast sausage in this scramble: Johnsonville Brown Sugar & Honey. This sausage flavored this dish perfectly! I love the hint of sweetness from the brown sugar and honey. It was just the right balance to this savory breakfast dish. 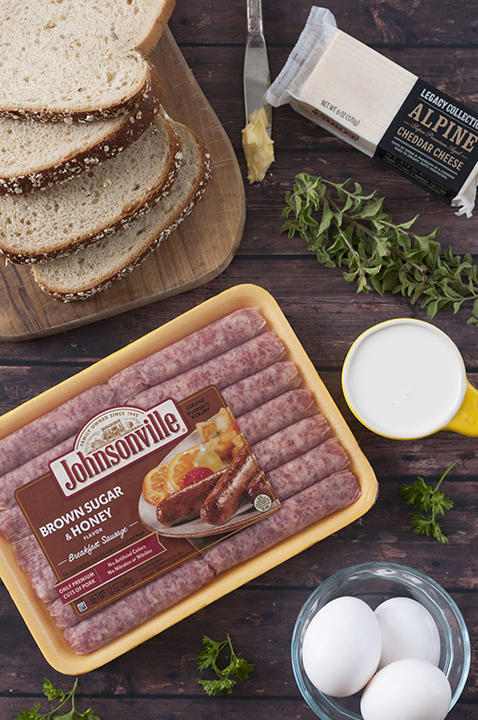 Johnsonville products are always of the highest quality and a staple I like to always have in my fridge or freezer, ready to go when I need it. They also have new Flame Grilled Chicken that’s delicious! To make this even more of a hearty “brinner” meal or breakfast, serve it with some toast and a side of home fries. 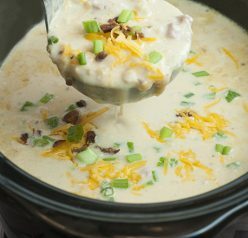 This is comfort food at it’s best, folks! My husband can eat breakfast food for every meal if he could and he absolutely loved this sausage, egg, and cheese scramble. If you’re looking to get a little crazy, you can even place it all inside some warm flour tortillas and turn the scramble into breakfast wraps! My Steak and Egg Breakfast Burritos are another great option if that’s what you’re going for. This is the easiest, most budget-friendly meal and your whole family will go crazy for it. You can find out more information on the support center and receiving help with meal planning at the Sausage Support Center website. Bob’s suggestions gave me amazing inspiration for next week’s meals! You can also see another recipe that I created with Johnsonville Sausage: Mini French Toast Sausage Roll-Ups. Enjoy! Place sausage and diced onion in a large skillet. Cook over medium high heat until onions are translucent and sausage is evenly browned. Drain this mixture and chop sausage into bite-size pieces; set aside. While sausage and onion are cooking, beat eggs and half & half together in a mixing bowl. Pour eggs into the skillet. Add cheese and cook just until eggs are set. Stir in sausage, add salt and pepper to taste, and serve warm. Enjoy! Anything eggs, cheese and sausage or bacon is about my favorite thing ever. Breakfast, Brunch, Brinner….give me it all! 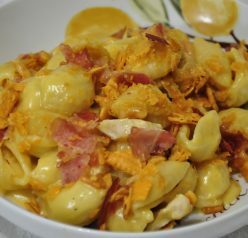 Mmm, I haven’t had breakfast yet, and I’m SO craving this! Really nice dish — thanks. Thanks for sharing. Definitely making this recipe tomorrow for the Fam for Sunday breakfast.